Recorded: Kosei Nenkin Kaikan, Osaka, Japan March 29, 1976 First Show. Bonus show from Nichidai Kodo, Tokyo, Japan April 4th. 1976. Comments: The complete recording of March 29th. 1976 the day of the department of Osaka performance with high quality. This show was first released many years ago, on a 2lp vinyl album called 'Zoom Queen'. Later on, released on 2cd by Japanese Wardour label, with title 'Operatic Afternoon'. I'm not sure if this release included the tape used on previously released bootlegs. Bonus tracks from the April 4th, Ryogoku Kokugikan, Tokyo performance. Roots: From audience tape recording. I'm not sure if this comes from a already used tape, or from a new un-used one. I don't have this bootleg. 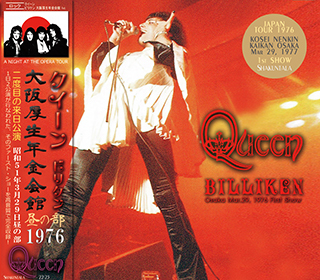 Than Queen second time Japan tour, the Osaka Welfare Pension Hall performances March 29, 1976, was completely recorded in high-quality title arrived. This day has been conducted performances twice a day, recorded in this work has been recorded first Shaw, a matinee. From announcement of “Lady ~ vinegar Anne Gentlemen!” In the opening, the last to “God Save the Queen”, fully recorded in ultra-high sound quality that I do not think 40 years ago. Just met with Japan tour of time popular had been boiling in Japan, the enthusiasm is among the successive live Hakubi. Person who the popularity of height in Japan are also aware, service the first time that in addition to the enthusiastic performance that does not disappoint, to insert the MC of Japanese everywhere. Word of Brian “Queen and to have connected with Japanese fans special bond” which was issued at the time of the Great East Japan Earthquake, not just your affable, exactly, under the many years of trust relationship that has been nurtured from this era you can feel vividly is that were of. As a bonus track, the last day of the Japan tour of the same year, we have recorded April 4 Ryogoku Kokugikan performance. Analog boot carefully raised, as it was removed Hari-on, it can be said that valuable recording while incomplete. 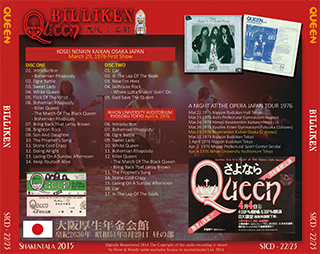 Than Queen second time Japan tour, to complete recording the daytime part of Osaka Welfare Pension Hall performances March 29, 1976 in the high-quality sound. Furthermore, in bonus track a tour final performance in April 4 Ryogoku Kokugikan. Permanent preservation Athletic Press board of beautiful picture disc specifications. With Japanese band.